Warning: Grammar-Nazi's are shot on site. 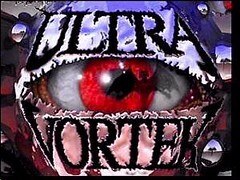 Saying that Ultra Vortek is the best fighting game on the Jaguar would actually be a back handed compliment (Kasumi Ninja and Fight for Life offer little in the way of competition ) and I would hardly want to insult this game, as I enjoy playing it. So instead I’ll say that Ultra Vortek is a solid fighter by any measure. Even though it has shortcomings I find it fairly easy to overlook what its lacking. When push comes to shove, the determining factor of a game's worth for me, and surely many others, is if it is fun or not. This game is fun. Ultra Vortek borrows heavily from other fighters, mainly Mortal Kombat. I won’t go into all the similarities, but I will say that if you are going to copy a popular franchise you better do it reasonably well. Thankfully Ultra Vortek does. In fact, in several ways I think its superior to MK. Let me explain that last statement, by saying that I mainly refer to the cast of Ultra Vortek. With just 7 to choose from, this admittedly could be considered a weakness. But I’ve always liked fighters that had unique characters as opposed to those that churn out more of the same Street Fighter rejects. Ultra Vortek’s fighters just seem to be fleshed out better than the bulk of MK's crew. This, of course, is purely my opinion and quite possibly will be scoffed at by some. But I really do like how the game has a mix of not just standard humans, but creative non humans as well. The contestants from ‘The Society Of Machines, Androids, and Cyborgs’ (long name huh?) are the best in my opinion. Cool fighters with their mechanical looks and attacks, these robots are quite fun to battle with. Likewise, the ‘Powershifters' (shape shifters basically) offer some different fighting fare from the norm, and they are also fun to use in combat thanks to their diverse moves and fluid animations. Each group of characters even has a (*shock*) half way acceptable story to back up the fighting (although the main tale will make you roll your eyes ). Again, totally subjective worthy of mention. Besides being unique, the fighters in Ultra Vortek look good. They are colorful, have interesting designs, and for the most part are animated pretty well. The same and can’t be said for the levels they fight on, at least not all of them. Some are too interesting for their own good, to the point of near distraction. (ex –The Stoned Poseidon with its variety of statues, and fish leaping from the water) Others are bland and uninspired (ex - The Shadow Zone … a lone brick wall is just plain lazy ) Several have elements of poor taste too, and I admit I did miss some of the more traditional locales found in other fighters. But still, despite not taking true advantage of the Jag’s hardware, Ultra Vortek is a good looking game overall. My favorite backdrop is ‘The Land Of The Storm Bringer’. 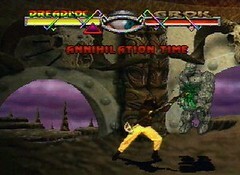 You fight on a mountain cliff as a purple sky rolls by in the background, a lighting storm taking place within. The skulls of strange animals hang above the archways looking out to the storm. And pillars on either side of the archways have ... moving eyes? Whatever, it is my favorite of a weaker bunch. The music in this cart is predictable in that it’s pretty forgettable (a common occurrence on the Jag, sadly) but it does have strong sound effects. All the punches and kicks ring clear, and the announcer (though a bit cliched) is appropriately chilling. Even the fighters chime in with occasional speech. No need to hit the mute button on this one. I will call out the game for a couple things, although not too much. I mentioned the bland shadow zone level earlier. Here, you fight the shadows of previously defeated foes. This is not only mid-numbing in my opinion, but it is a cheap way to make the game longer. No thank you. The other knock is the games challenge. It is much too easy in its default mode. You’ll need to up the difficulty in the options or risk disappointment as you fly through the game with little trouble. Even the much touted end boss was cake. Ultra Vortek is just too easy. A clone fighter with a small cast, weak music, and too easy to boot … the faults are clearly out there. But it seems I just don’t care. The game is fun, pure and simple. And it is one that I can pick up and play often without it ever feeling stale. The replay is strong. Despite falling short in some respects, Ultra Vortek is a cart that pleasantly surprised me, and it may just surprise you too. This review never got any comments, but I still say UV is a really good fighting game. Bumping to see what other Jag fans think of it. I think that Primal Rage aside (not that it counts for much, considering it's inferior to the 3DO one and is on the Jaguar CD), Ultra Vortek is the best fighter on the system. But of course, that's not saying a lot. I think it's a little slow, could use some improvements in the responsiveness department, and the framerate isn't as smooth as it should have been (it should have run like Mortal Kombat or Kasumi Ninja). The backgrounds do look pretty sweet, and the poopalities I suppose have to count for something, but I find the game absurdly simplistic (*no* combos whatsoever, not even the makeshift ones like in MK2), so for me it's mildly enjoyable at best. There are so many better fighters from the same generation that hold up much better, and not to mention offer deeper gameplay experiences. Ultra Vortek for me is a curiousity at best these days, and it's something I feel is better left in the past. Ha ha ... a bit negative, but that's no biggie. It's good to get other opinions. The game is too simple but I still like it ... though how much of that is due to my nostalgic fondness of that era is something to consider. Just for clarification, do you like Kasumi Ninja more? Don't get me wrong--I like the game. I just find no reason to play it when I could be playing something else that is going to give me ten times the enjoyment factor (says the guy that spent an hour last night playing Battle Monsters on the Saturn.. ugh.. Well at least in that game you can pseudo-juggle, and it has more variety). Kasumi Ninja is pretty weak for obvious reasons. It gets things better in certain regards (nice, smooth framerate), but it's equally as shallow as Ultra Vortek. Even more so, actually. UV is better, IMO. Ah ok, good to know. I tend not to notice framerate issues much, unless the game is dreadful. Since I have fun w/UV, I guess I overlook it. 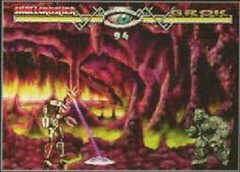 For what it's worth When I was on my splurge of watching Jaguar gameplay videos, Ultra Vortek was the one fighter in the half dozen on the platform that looked like it might be decent. Martin III wrote: For what it's worth When I was on my splurge of watching Jaguar gameplay videos, Ultra Vortek was the one fighter in the half dozen on the platform that looked like it might be decent. That's pretty much what I figured. I still think I'll pick it up eventually since it goes for cheap. Do it, then write a review. At least the animation is much smoother than the SNES and Genesis versions. Probably the only multi-platform game that really demonstrated the Jaguar's superiority to the old 16-bit consoles. Hmm, I can't believe I missed this review. Very well done, however, I disagree with the Music comments. Then again, I am a huge music buff, so I guess that might lend to this comment. I actually liked the music in Ultra Vortek, especially since it's LEAPS and BOUNDS better than that of Kasumi Ninja. Then again, I guess it';s all opinion based. We didn't have a contract with Universal, so we didn't get White Zombie. Seriously, I really agree that Ultra Vortek is quite the solid fighter. Very well put together and very fun to play. It also shines in the fact that it proves that the Jaguar pad isn't as horrid as some have made it out to be as pulling off the moves really isn't that bad. Just goes to show that programmers could have gotten things better. Nice review Trev. Well written by a future Jaguar Fanboy. Thanks for the comments T2K! I haven't written a Jag review in ages, so I'm long overdue for another. I guess I agree with Austin. I'm not a great fighter game player though I like them. But it always seemed that UV was missing something. Animation, gameplay. It was like an ambitious first fighter for this company and they are just getting the hang of it. I probably would of liked their sequel better. Like Trev said, saying UV is the best fighter on the Jag IS a backhanded compliment. Compared to a lot of the library, it really was solid and professional effort. Animation isn't as smooth as KNinja, but the game plays better and the characters are far more interesting. The only one's I'm not too fussed about are Grok & Mercury, the rest are decent. Touching on the music, I too rather like its grungy tones. I especially like the character select (Mosh) theme. It's very cool! Talking about Dragon... the Jaguar version is definitely the best looking, aesthetically. However, I have owned the SNES & MD versions too and I can honestly say, those versions play better. For whatever reason, they made changes to the Jag version which makes the game much harder to get along with vs it's 'mere' 16-bit brethren. 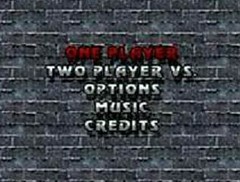 For the record, I rather like Dragon (HUUGE Bruce Lee fan, mind) and enjoy playing it. I don't treat it as a standard/regular one-on-one fighter, because it isn't one. It's a different beast. Knowing this, you might enjoy it more as a result... unless you are terrible at it! How many colors would you say UV uses as compared to Primal Rage on the Jaguar? a31chris wrote: How many colors would you say UV uses as compared to Primal Rage on the Jaguar? UV is a pretty colorful game. If a darkly-colorful game, at least. Was just trying to extrapolate Primal Rage with less colors how much that would free up memory for bigger sprites.